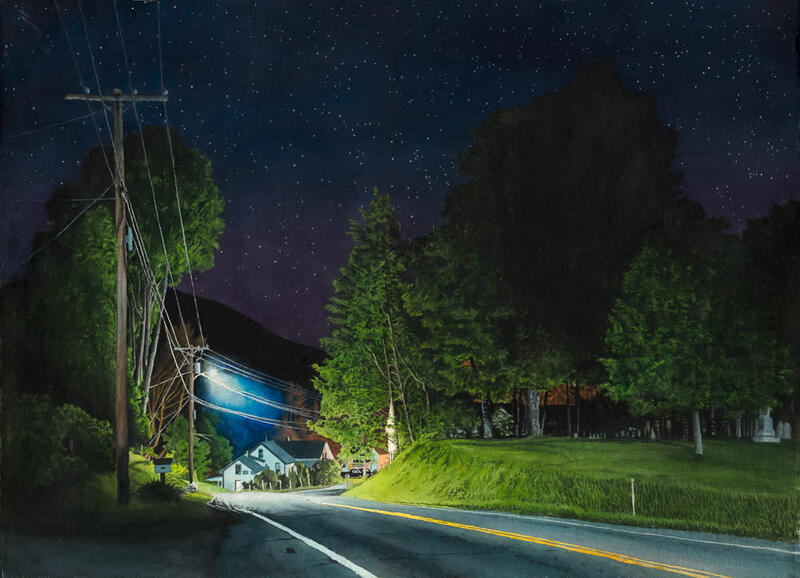 (Watercolor On Paper 22" x 30") This is from a trip to Vermont in early fall 2015 to attend a celebration of the opening of the unusual summer camp where I worked when I was a teenager. I spent my last night traveling around the towns in the area photographing night scenes. This is a bend in the road of Highway 100 where it passes through Pittsfield, Vermont. To the right is a cemetery and the road curve down a hill and then leads out of the little town north. 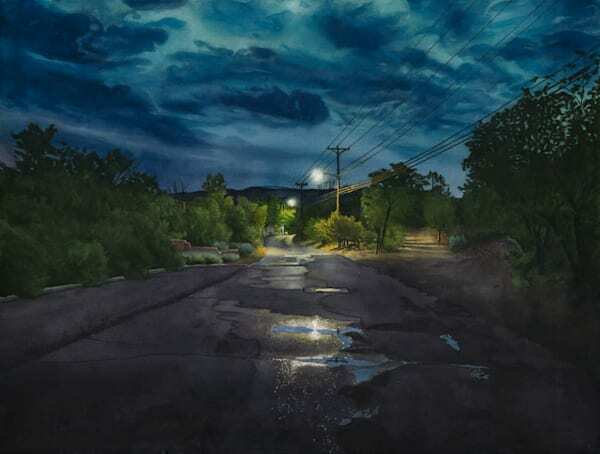 (Watercolor On Paper 22" x 30") This is early in the morning on Upper Canyon Road in Santa Fe, north of where the galleries are. I love the quiet, almost surreal quality to the world then. Dawn is just about to break over the horizon. 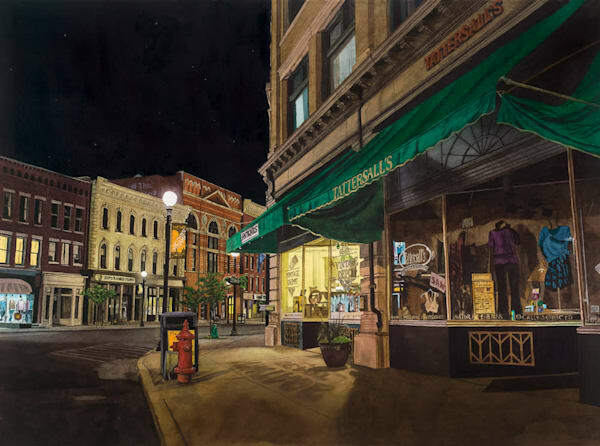 (Watercolor On Paper 22" x 30) This is a view of the town of Rutland, Vermont late one night. I spent an evening wandering through Vermont when I went back to celebrate a reunion at some summer camps where I worked many years ago. 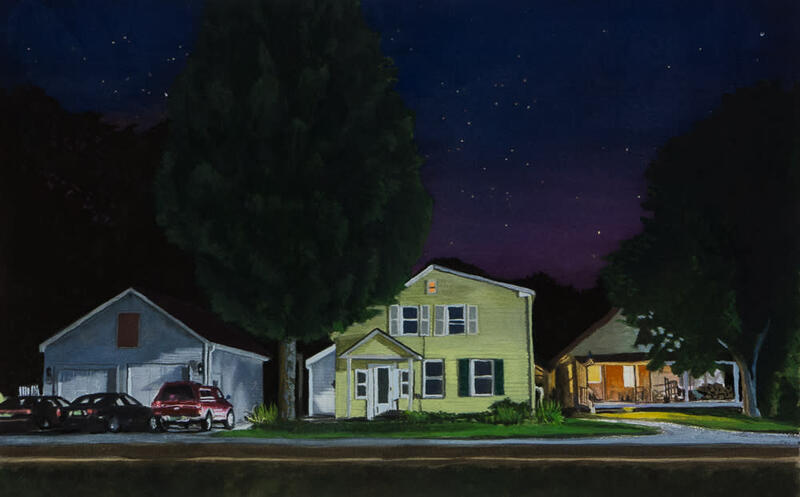 (Watercolor On Paper 22” x 30”) This is a neighborhood in a little town in central Vermont late at night. I worked nearby as a counselor at a Quaker summer camp for boys many years ago and went back to visit the area some thirty years later; very little had changed. 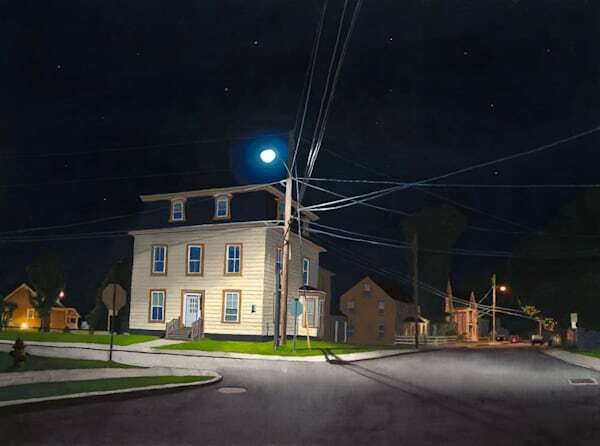 I love the quiet charm all the little towns around this area have, and the way they feel at night, when everything is still. 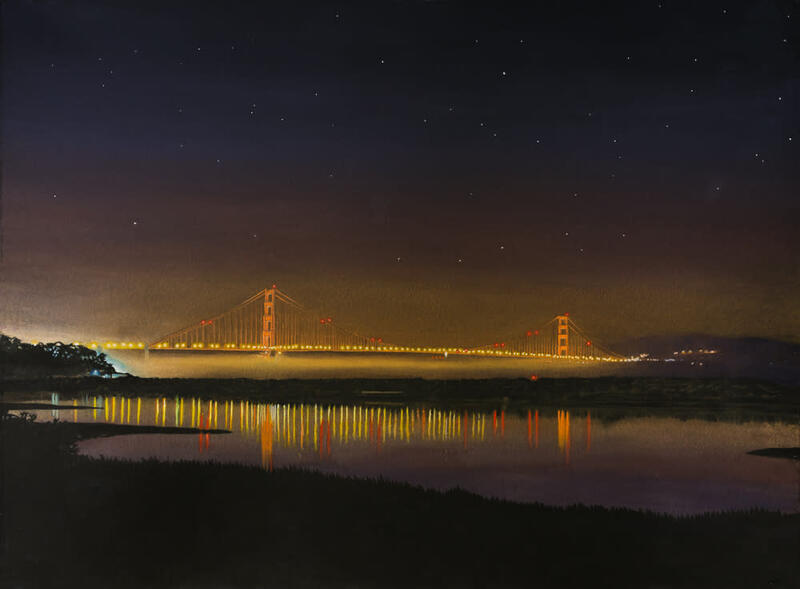 (Gouache on Paper 22" x 30") This is a view of the Golden Gate Bridge seen from Chrissy Field Marsh very late one winter night. It was very still, and not a soul was out that night. I was struck by the magical quality of the scene. This began life as a watercolor, but is now mostly gouache. 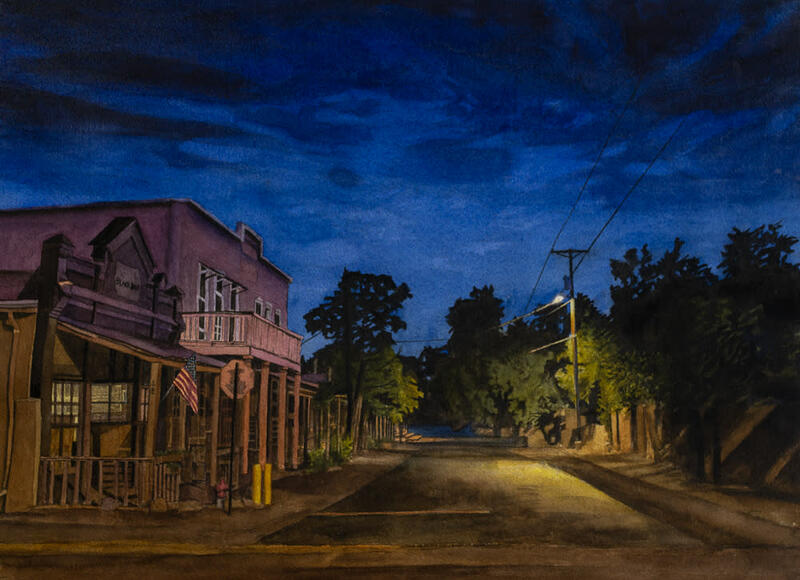 (Watercolor On Paper 34" x 54") This is a large nocturne from the little town of Madrid, 40 minutes south of Santa Fe. 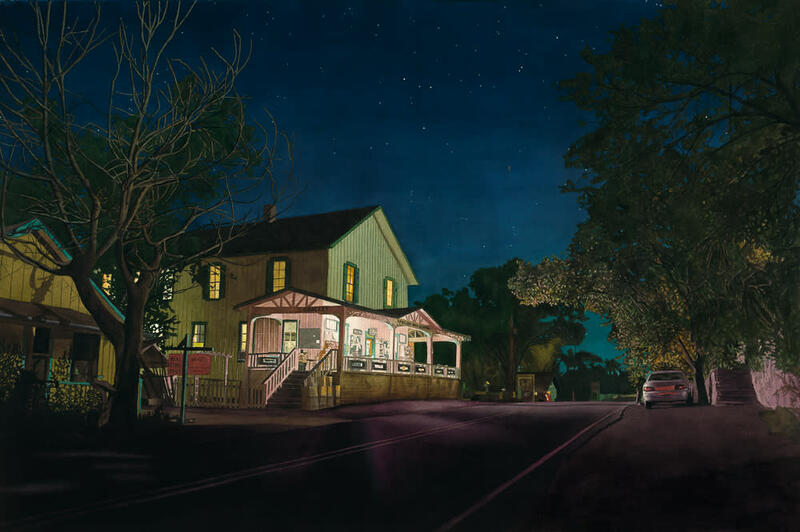 Shortly after moving to Santa Fe, I spent a night traveling around the area taking photographs. This is the Boarding House General Store in Madrid about four in the morning, It was once a mining town and now is full of artists and galleries and lovely little shops. 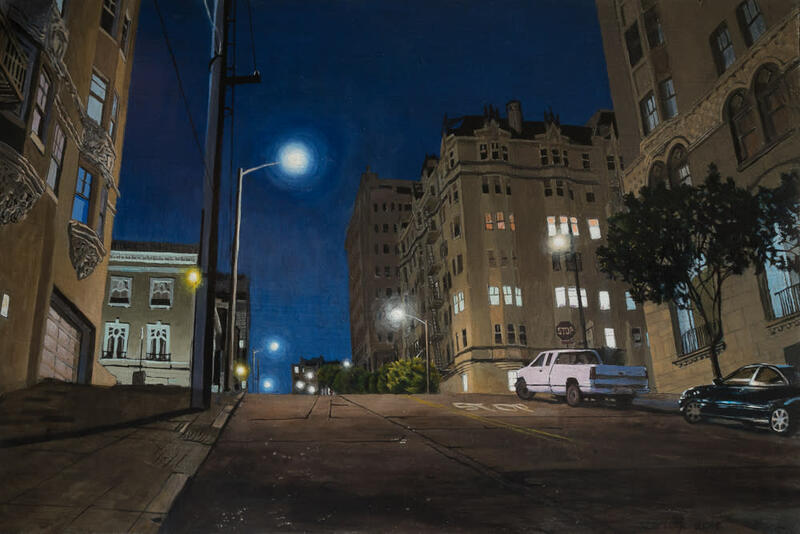 (Acrylic On Board 36" x 77") When I was waiting tables in Santa Cruz, many years ago, one of my roommates used to let me borrow his car and drive around at night. 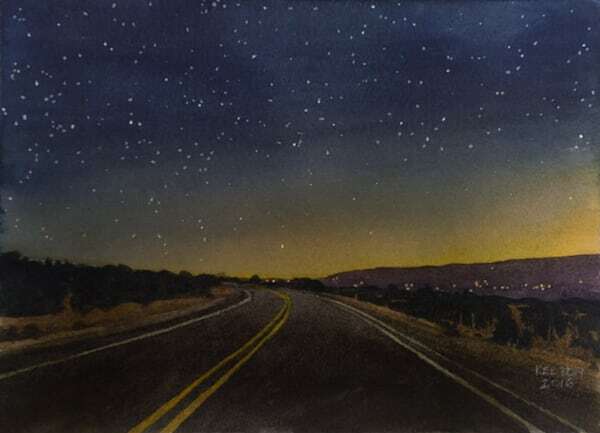 I did a watercolor painting from memory of this stretch of Highway One (and from drawing the inside of his Datsun B210) which was pretty terrible. It stayed rolled up for thirty years, and then I thought I would try and resurrect it. Even though the painting was terrible, I liked the mood and the idea. I gradually revamped it with present day photographic reference from that stretch of Highway One, and it turned into a pointillist gouache painting in the process. (Watercolor On Paper 29" x 41") When I first moved to California in 1982, I lived in Santa Cruz, and would occasionally borrow one of my housemates cars and go driving up in the Santa Cruz mountains at night. Many years later, before I moved away, I revisited that area. This is a watercolor from the side of the road near the fire station up there. It’s their Christmas lights that cause the blue spill on the right side. (Gouache on Paper 31'" x 56") This is the pool where I went to college in the middle of the night. I started it when I was in college and finished it some thirty years later. (16" x 24" Watercolor On Paper) This is just as night was falling in the old mining town of Cerrillos, New Mexico, just south of Santa Fe. I was coming back from Albuquerque in the summer and it was raining everywhere, so I decided to take the back way into Cerrillos because the world was so beautiful that day. The blue in the sky is from all the water still around, and night is just falling in the town. (12" x 18" Acrylic On Board) This is from a late night ramble around the area overlooking the Marina one night, after I had moved to Santa Fe but was still working occasionally in San Francisco. After three decades here, there is a certain wistfulness about this special place in this image. 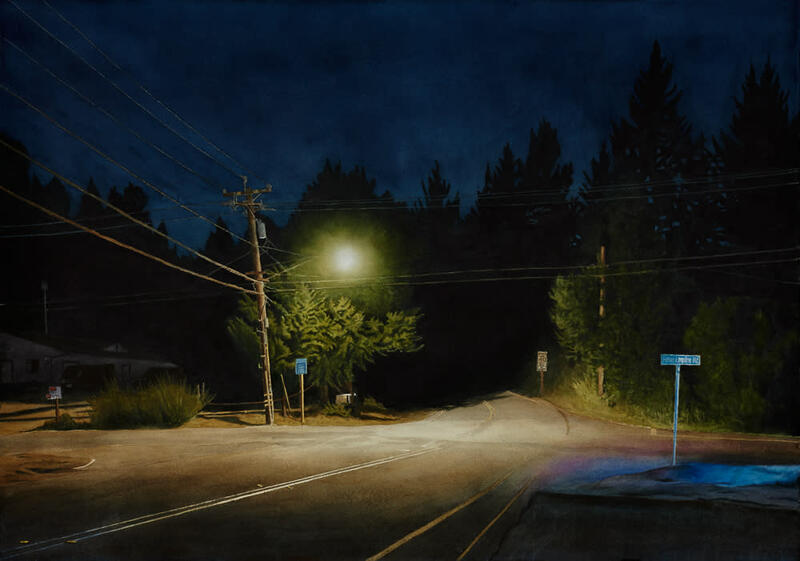 (22" x 30" Gouache On Paper) This painting is from a very early summer morning on the section of Canyon Road in Santa Fe above the galleries where it gets less populated and feels more like old Santa Fe – at night anyway. Dawn is still a little ways away but the rainy sky is starting to show. 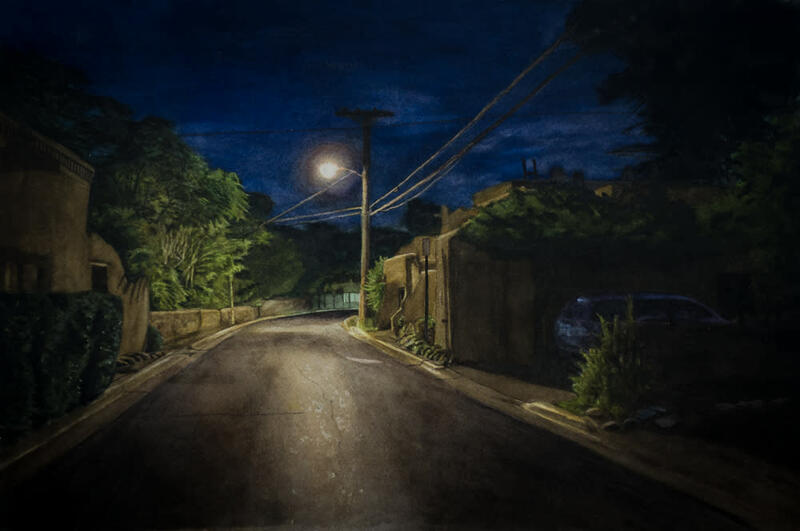 This was a study for a larger watercolor which lay unfinished for a few years before I took it up again. (11' x 14" Acrylic On Board) This is the little town called Madrid south of Santa Fe. 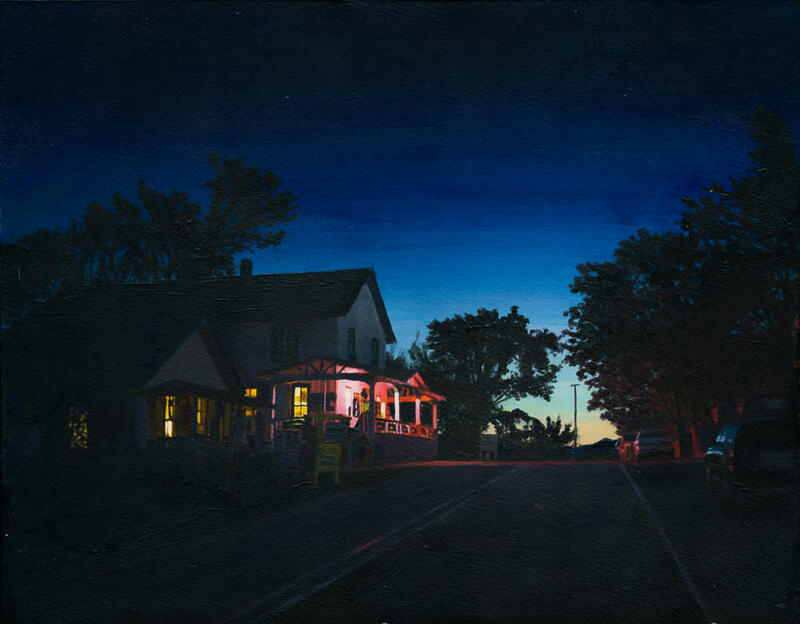 This is looking at the Boarding House General Store just as dawn is beginning to show on the horizon. 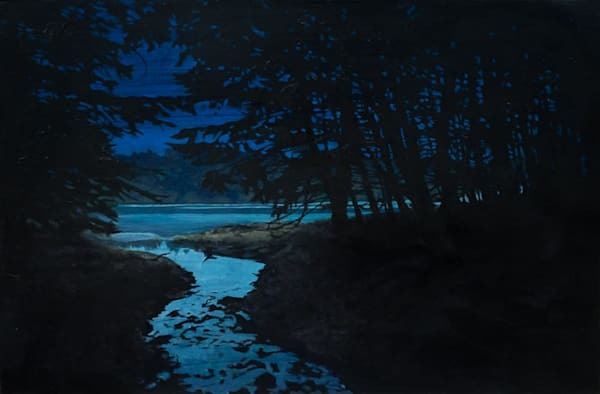 (12" x 16" Acrylic on Board) I spent many years walking my dogs around this lake in Northern California This is from a trail following the shore just as night was falling. This was a hurried photograph with a cheap camera, so the painting is a little more stylized than many of my others. 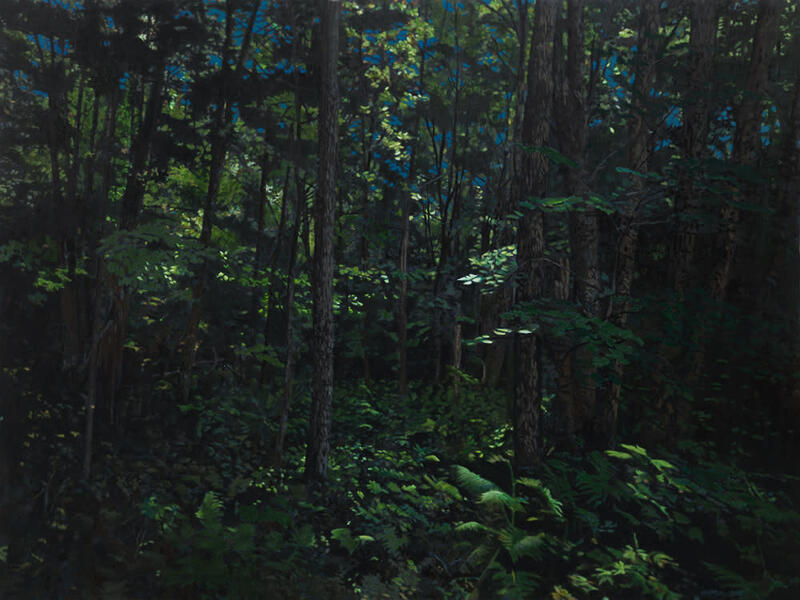 (36" x 48" Acrylic On Board) This a forest in Vermont a little outside the Quaker boy’s camp where I worked many years ago. I went back for a reunion and set up a camera that recorded photographs all night. This is with the moon high overhead late at night. (8" x 12" Watercolor On Paper) This is highway 14 heading north, looking towards Santa Fe in the distance just as dawn is beginning to show.. This is a study for an eventual larger painting. 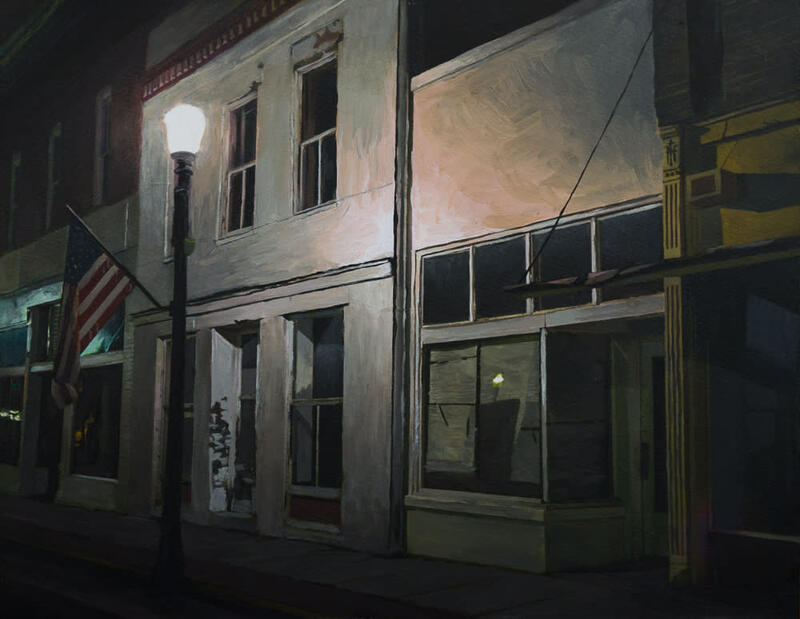 (11" x 14" Acrylic On Board) This is the little town of Jonesboro, Alabama late at night the day before Labor Day. 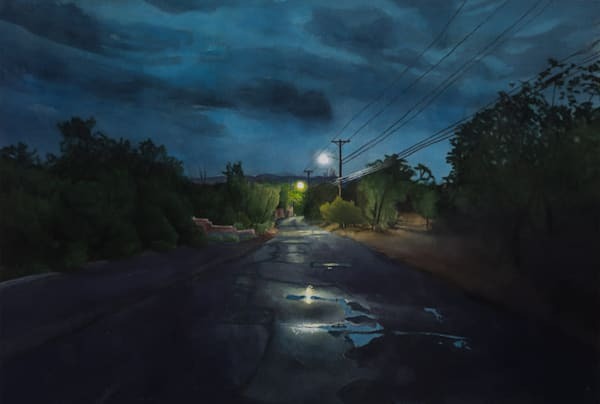 (15" x 22" Watercolor On Paper) This is a watercolor of Canyon Road right where it turns into Upper Canyon Road late one summer night. I used it for a watercolor workshop demo and it sat around unfinished until I couldn’t stand having all these unfinished paintings around anymore. (12" X 16" Watercolor On Paper) I spent many years walking my dogs around this lake in Northern California This is from a trail following the shore just as night was falling. 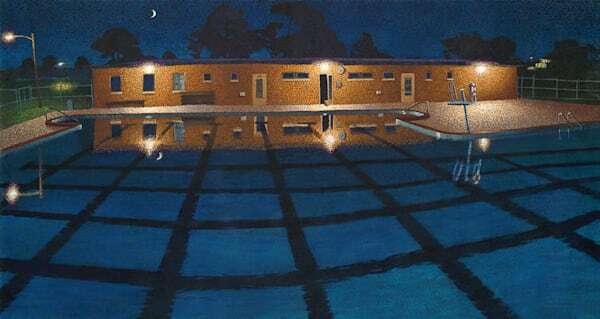 This was a hurried photograph with a cheap camera, so the painting is a little more stylized than many of my others. (10" x 15" Gouache On Paper) This is a gouache study for an eventual larger painting. Pittsfield is a tiny little village in central Vermont. I was wandering around at night in early fall and found this lost in time place and spent some time walking around. I love the silent and surreal quality of these little towns at night. 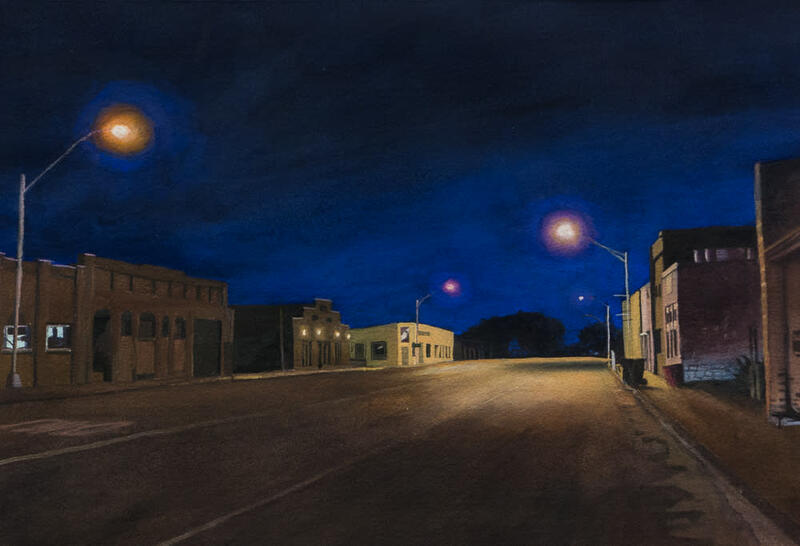 (11" x 14" Gouache On Paper) Estancia is a small town west of Albuquerque surrounded by farms. I was struck by the lost in time feeling that the downtown had when traveling through, and went back one night to capture that wonderful eerie feeling there. This is a small study in gouache for an eventual larger painting. 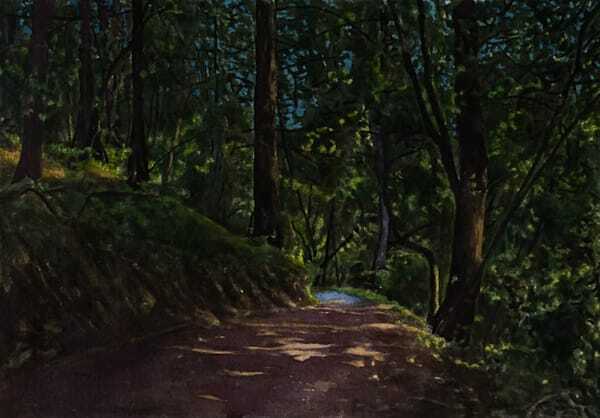 (10" x 15" Watercolor On Paper) This is from a nighttime hike on Mt. Tamalpais in Marin County, Ca.